89135 homes for sale include some of the most affluent gated communities in all of Las Vegas and Summerlin homes for sale. Downtown Summerlin is the main draw for food, shopping and entertainment. The 2 most popular gated communities with walking trails are The Ridges Las Vegas and its neighbor Red Rock country club homes for sale. Buyers who search advertisements and prices on luxury homes will find the property normally in the 89135 as it currently out sells other zipcodes for $1-Million plus custom homes. See more information below listings for public information on this community. Most communities are gated and by appointment only. The is the go to place in Summerlin, especially because it has an Apple service center with staff on hand to trouble shoot iphones, ipads and apple devices. It also has a luxury theater with couches and food service on high res screens with surround sound. The popular 5-star rated Trufusion yoga studio is nestled on the 2nd floor among popular boutiques and cafes. “It is physically impossible to have a bad teacher or class here! Will over 100+ stores and cafes there is something for everyone and there is also normally events taking place. For more on this massive commercial and social complex you can check tenants and schedule at Downtown Summerlin. This is a popular area for lunch meetings and evening walks. Check Groupon by location search and sometimes great food coupons can be found for this district. The Red Rock hotel casino has had one of the #1 rated all-you-can eat buffets for years running. It is also one of the few places still offering $1 margaritas at the sports bar. The bowling alley, movie theater and bingo combined draws a huge local crowd. Red Rock is know to be a leader among amenities for local casinos. 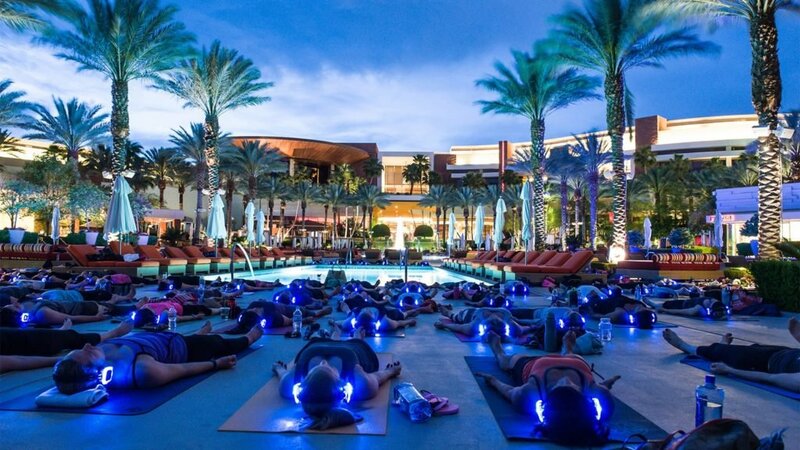 The pool is world famous and sometimes offers open events like full moon yoga to locals. They also run a concert series and full entertainment schedule that can be found online here for Red Rock.